This tree is on the northwest corner of Scarritt Place and 19th Ave.S. It is not on Vanderbilt property, so please respect the owner and observe the tree from the sidewalk. This tree is included on the Vanderbilt tree tour because there are no living examples of overcup oaks in the arboretum. 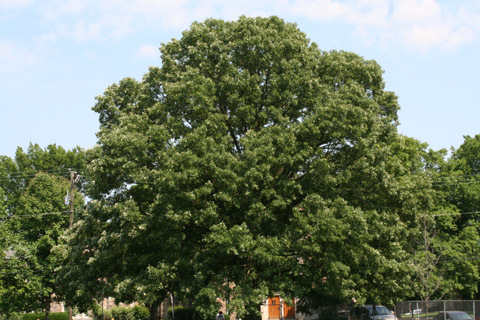 The Garland Oak, a famous tree in the early history of Vanderbilt was a member of this species, and the pub in Sarratt Student Center is named The Overcup Oak in its memory. You can read this story 1917 about the Garland Oak. Overcup oaks are best recognized by their unusual acorns, which are mostly or nearly completely covered by the scaley cup. The species name lyrata comes from the shape of its leaf which is supposed to be "lyre-like".